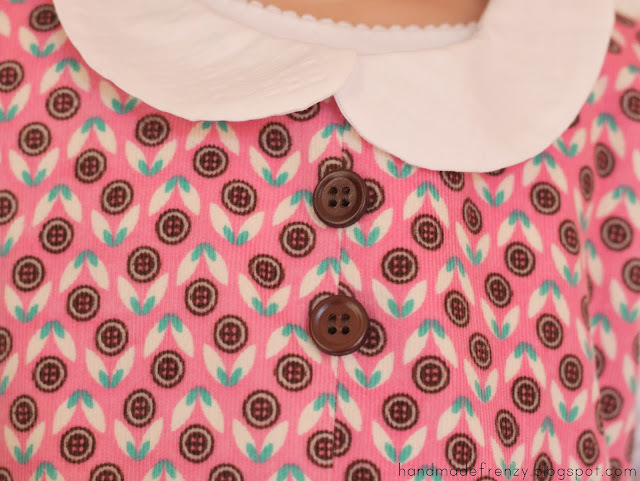 I'm so excited to be telling you about this pattern today! It also happens to be the first item I have completed for Kid's Clothes Week! I decided to join in very last minute, so I will not be cranking out the awesome amount of garments that some of the other ladies are ;) But I am following the rules, work on kids' clothing, at least one hour a day, for seven days. But since I didn't plan ahead, that means I am spending time printing, taping and cutting out patterns, choosing fabrics and cutting, all before sewing. I like the challenge! It's helping get my "kids' clothes mojo" back :) I haven't stopped sewing at all, I've just been sewing for my Etsy shop and other custom orders lately, so it feels good to make something fun and functional for the kiddos again. Debbie's Birthday Dress, by the lovely Suz from Sewpony, caught my eye the minute it hit blogland. In fact, I had this pattern "queued" instantly! But as things go, I never got around to sewing it up. I even had the pattern in my files, all I needed to do was choose fabric and sew one up for the little miss. Well, when Suz decided to make a few changes to the fit (dress width and length), and asked if I'd be willing to sew it up with the new adjustments, that was just the push I needed! 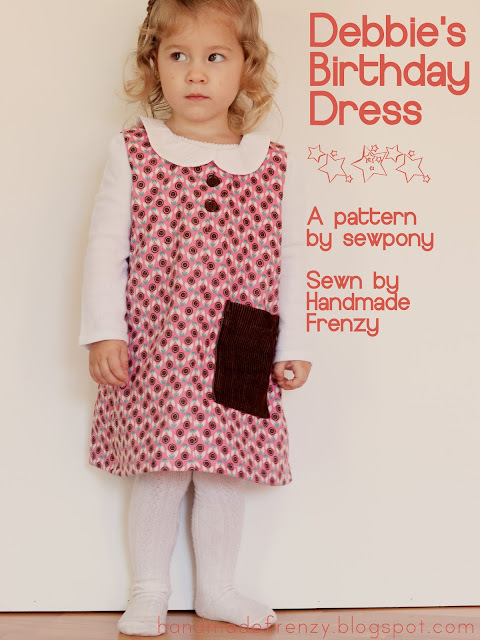 I chose to sew View 2, with absolutely no changes to the pattern, sewn exactly as written, in a size 2y. I love it. Love. Love. Love. It! The fit is just perfect. So darling. And versatile. That's huge to me in a pattern. And this one is spot on. It is a sleeveless pattern, which is great for summer, but also loose fitting enough that a tee can be layered underneath. I am SO excited for her to wear this the fall and winter. It will be one that will be worn over, and over and over. It's just that perfect! The pattern is great for beginners, as there are no zippers or button holes! I chose to use this fabulous, lightweight, and oh, so soft, corduroy that I've had in my stash forever. I bought it on a whim the first time I went fabric shopping at Joann's specifically for clothes for Miss O. It was a good choice, absolutely perfect for fall and our mild winters. The pocket. Oh, she loves her pockets :) I made the pocket from a larger wale (?) remnant piece that I picked up at Joann's. It complimented the main fabric perfectly! After a little searching I found the PERFECT ones!! Genuine leather. Yes. For real. And the color could not have been better! Miss O loves the dress too. After the pictures were done she didn't want to take it off. Fine by me! Thank you Suz, for such a fantastic pattern! And for the rest of you, it is ON SALE for less than $5 only through Oct 31, 2013!! So hurry on over HERE, and grab your own copy! So cute! Your little one is a doll! The dress looks great with corduroy. Heidi, so lovely!!! I've made quite a few summer time Debbie Birthday dresses and had be thinking of making warmer ones... well there you go, you just gave me the inspiration I needed!!! Sweet!! Thankyou Heidi for your kind comments about my pattern and I'm so glad you like it!!! Oh, this looks so cozy and adorable! I have on in the works (at least in my head) and I hope to get to it soon. I wish that I could sew so badly! Well, I have a nice sewing machine and tons of fabric but things don't turn out quite right. My daughter loves to wear dresses. Off to check out your apple butter recipe as we have tons to use up. I'm a new follower of yours on Bloglovin and would love it if you linked up to my weekly Bloglovin Hop if you're so inclined (http://www.journeysofthezoo.com/category/bloglovin-hop).